Stir together flours, cultured buttermilk blend, yeast, salt, and baking soda in a mixing bowl. Using electric mixer with dough hooks, add very warm water and mix until dough is shaggy. Add honey and melted butter. Add additional flour until elastic dough forms. Place dough ball onto a lightly-floured surface and knead several minutes. Let dough rise in a lightly-greased bowl, covered, for 45 minutes. 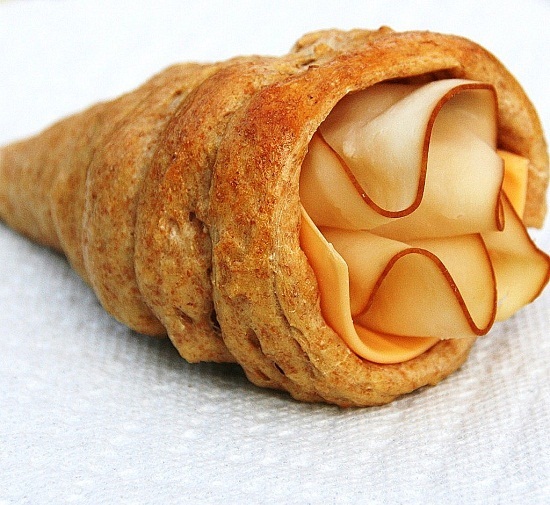 While dough rises, make cones. Take two sheets of thick magazine paper (the thickest sheets on the front or back cover of a magazine) and divide each sheet into 4 (which equates to eight 4″ x 5.5″ rectangles). Roll 6 of the 8 rectangles into a cone, starting from the smaller side so that the longer 5.5-inch sides comprise the top point and bottom circle of cone. Secure cones with piece of scotch tape. Wrap each cone with aluminum foil. Secure foil onto cone by folding it over rims of the circle. Punch air out of dough. Using a scale or estimating visually, divide dough into 6 portions. Roll one dough portion into a rope slightly over 2 feet long. Gently coil rope around pre-made cone and place onto lined baking sheet. Ensure that there are no exposed gaps of foil showing. Repeat with remaining dough portions. In a small bowl, beat together egg and water. Brush egg wash over cornucopia rolls. Bake for 14-15 minutes, or until slightly golden. Let cool before removing cone molds. To aid in removal of cone molds, twist and pull. If this doesn’t work, cut along length of aluminum foil and magazine paper with scissors. Fill with sandwich components, pot pie filling, turkey, stuffing, or other desired filling.